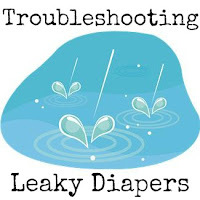 One of the most frustrating problems with cloth diapering can be leaks! I remember in my early cloth diapering days, I wished a "Cloth Diaper Fairy" could come to my house and help me troubleshoot my leaking diapers! Well, have no fear, the Cloth Diaper Fairy is here to help! Here are some common problems associated with leaking diapers and some quick fixes! If the diaper is soaked when you change the diaper, change the diaper sooner. You have reached the absorbency capacity for that diaper. You could also consider adding an extra insert, a doubler, or a more absorbent insert. Check the legs! Leg holes that are too loose or too tight can cause leaks! You should be able to easily insert a finger in the leg holes while your baby is wearing it, but you should not see gaping holes. If your diaper isn't absorbing at all, you have a repelling issue. You need to strip your diapers to solve the problem. Old microfiber inserts that have been used for a few years lose their absorbency over time, which can lead to leaks. Consider replacing your inserts. If you are experiencing leaks when your baby is sitting for long periods of time or while you are holding them on your hip, you may be experiencing compression leaks! Microfiber is prone to compression leaks when pressure is applied. Consider using natural fibers or adding a doubler. Have you been experiencing leaks? What have to tried in order to resolve your problems?